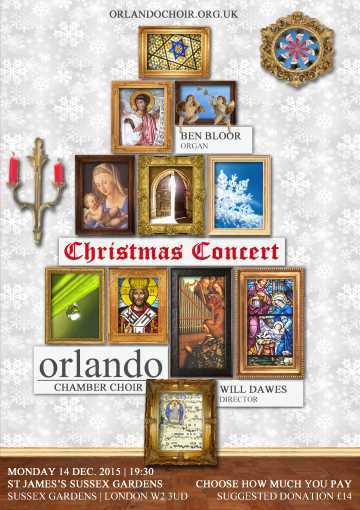 Orlando Chamber Choir presents a multi-faceted view of Christmas with varied settings of seasonal themes - including large-scale double-choir Renaissance compositions, subtle four-part 19th and 20th century interpretations, and even a contemporary choral glimpse of the glittering Christmas star. These vibrant musical tableaux will be interspersed with short Christmas readings and audience carols. To ease your singing we will serve wine and mince pies during the interval, which will be further enhanced by our traditional Christmas raffle.